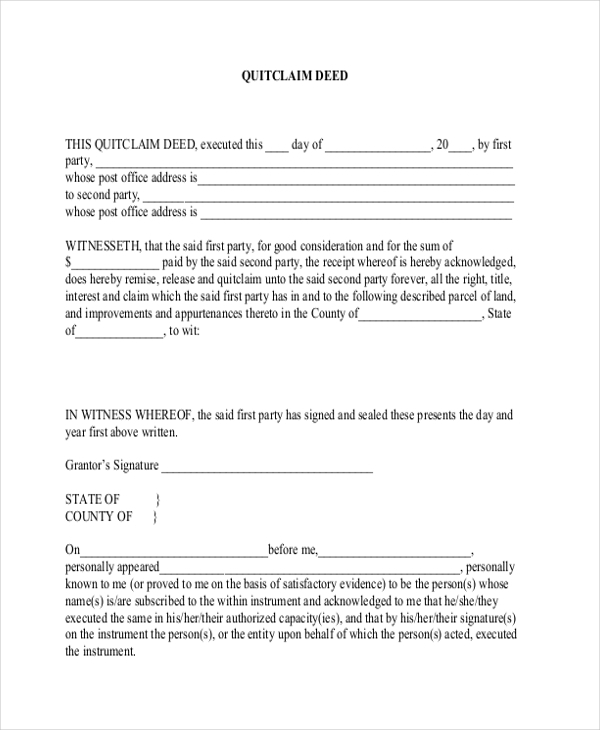 A quick claim deed form is really popular when the property or lot is being transferred between family members. Mostly it won’t involve any monetary transaction but in some cases, the transfer might involve buying price and the amount would be mentioned in the deed. One of the main highlights of such a Deed Forms is that it does not come with any guarantee from the property grantor or seller. Thus, it’s mostly conducted among parties who hold an undeniable trust between each other. This quick claim deed form comes with a considerable space for the legal description of the property to be transferred. It begins with the declaration of agreement between the two parties and concludes with notary’s authorization. 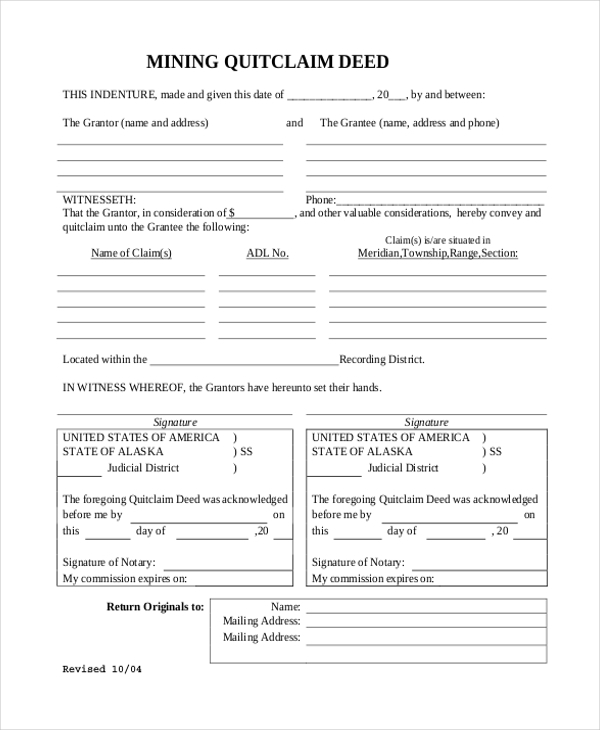 This Quick Claim Deed Form comes with a standard structure, starting with title order number, documentary tax transfer, the agreement between grantor and grantee, legal description of the property and finally notary’s authorization. 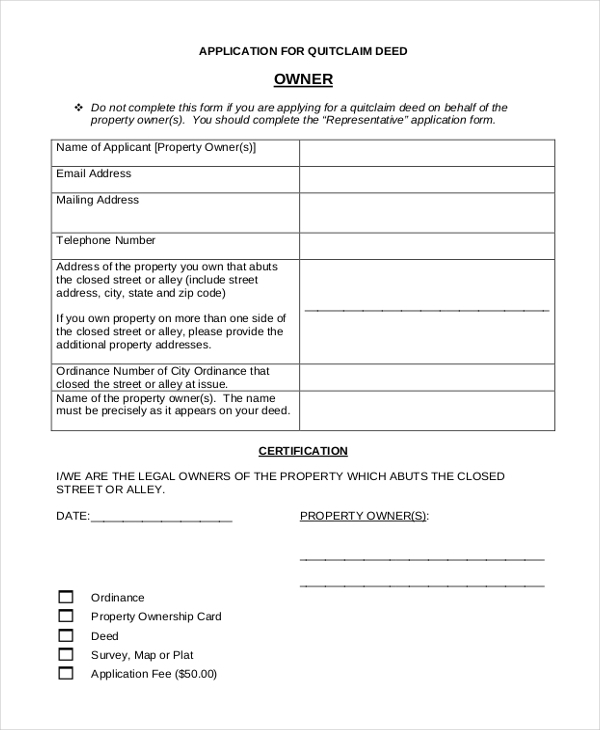 This quick claim deed form would be handy when the property transfer involves monetary affairs. It begins with the date of transfer and address of both parties, followed by the deed agreement, property description, and notary’s sign. 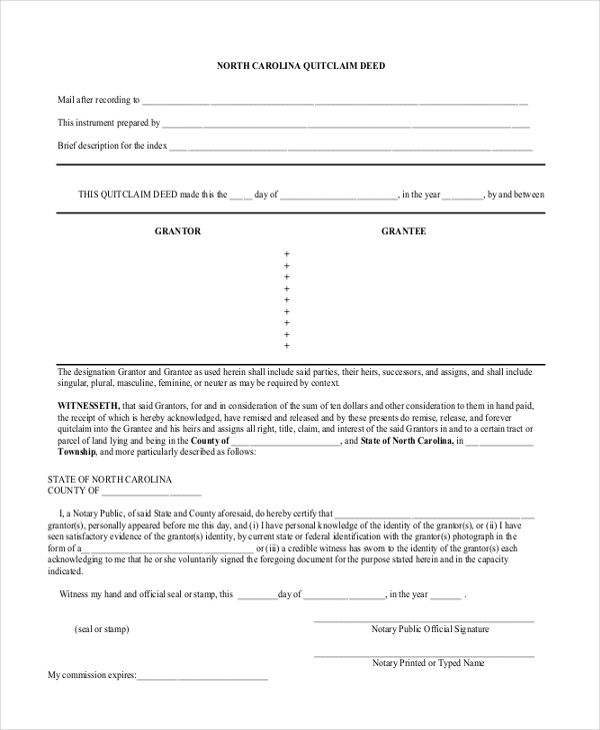 You have a very neat quick claim deed here which offers clear legible sections for the details of both the grantor and the grantee and would be handy when the property transfer is made in lieu of money. You may also see Quit Claim Deed Forms. 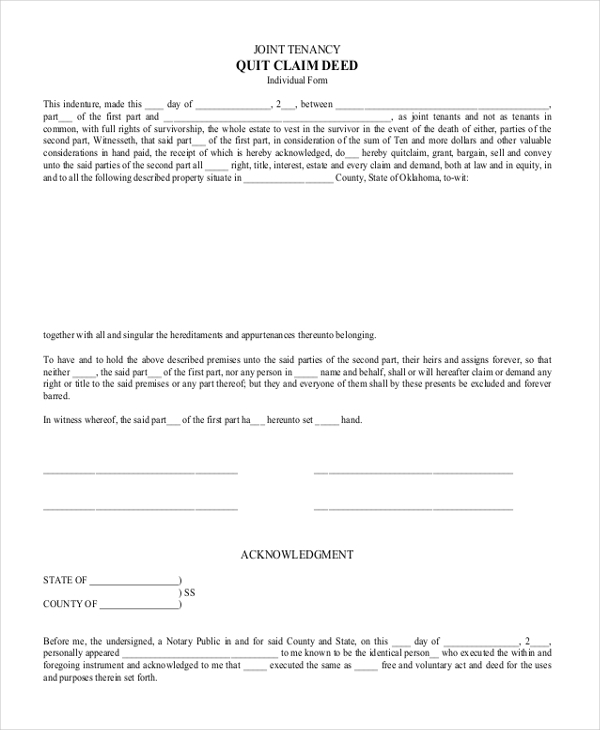 The quitclaim deed form here opens with a description of the index and then goes on with the time of the deed and two sizeable sections for detailed information on grantor and grantee. This deed is for transfer of a land or lot. 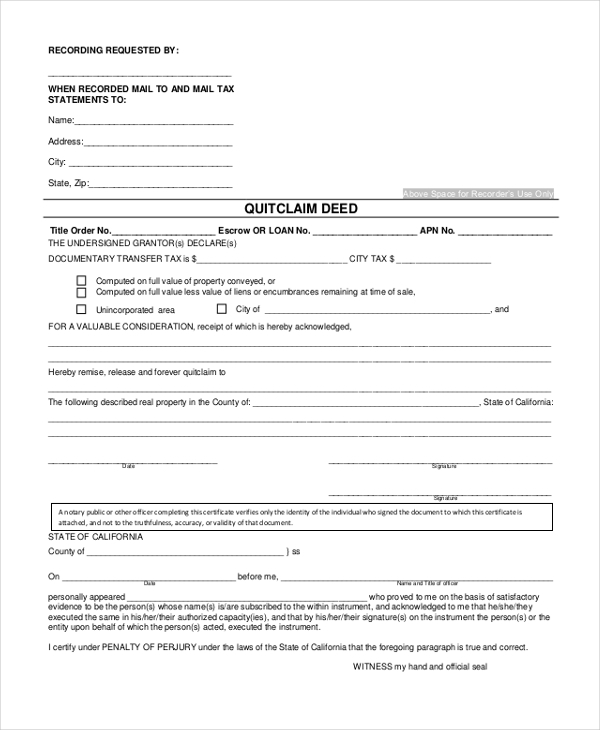 You are getting a sample of application for quitclaim deed form here which begins with the instructions to fill the application, followed by a blank customizable quitclaim deed application format. 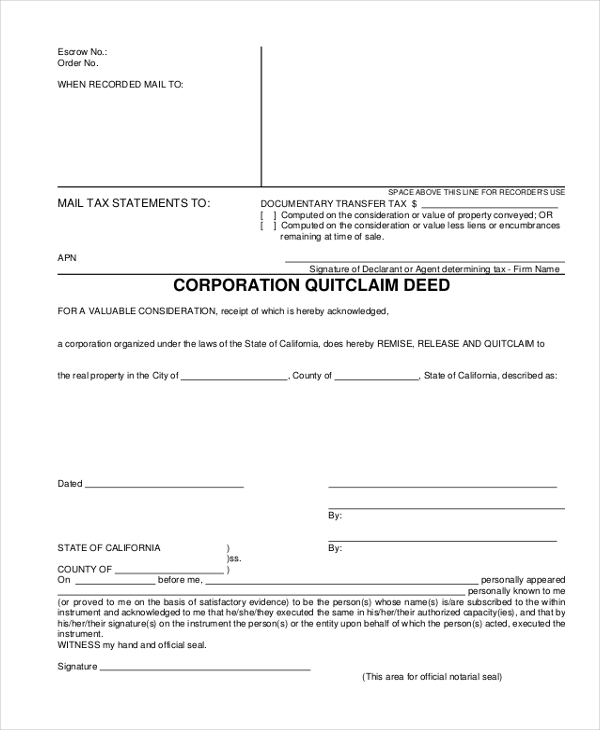 You have a brief and professional quitclaim deed form here that starts with tax statements, followed by the declaration of the quitclaim agreement on part of a corporate entity. You have a considerable space for describing the property. The form starts with space left for recording data and then goes on to cover deed tax due, the agreement between the grantor and the grantee, description of the property and notary’s signature. How Does a Quick Claim Deed Form Work? A quick claim deed form would be needed in regards to the transfer of properties- but unlike warranty deeds, these deed forms are specifically used when there is no guarantee from the grantor or seller. In most of the cases, quitclaim deed comes to play where there is no monetary factor involved in property transfer. It usually works when property or lot is transferred in between family members – like a father to son or one spouse writing the property to other in regards to terms of alimony after divorce. You may also see Warranty Deed Forms. What are The Uses of Quick Claim Deed Form? A quick claim deed form is primarily used during transferring properties to a family member. It is also used while transferring property to a trustee. But then, quitclaim deeds are handy to rectify errors or to clarify data in some previously drafted deed. Besides, such deed forms are deployed to clarify the tenancy (i.e. how the said property is actually owned by involved parties) among property owners. The tenancy clarification saves a lot of time as well as money by eliminating questions of ownership issues- in case anyone among property owners dies. You can also see Special Warranty Deed Forms. Do you need help in framing quick claim deed forms? These are easy forms but you have to be really particular about the legal lingo here. However, not to worry, as the quitclaim deed form templates online are ready to help you with their pre-designed deed structures that are conveniently editable with your own deed data.